My journey toward founding the nonprofit, HealthStart, began when I was six years old. As a first grader I was taking the school bus home when two twin sisters in 2nd grade sat down on either side of me. They called me a “Dirty Jew”, “Christ killer” and told me I didn’t belong in their school. Devasted by this experience, I left the bus in tears. 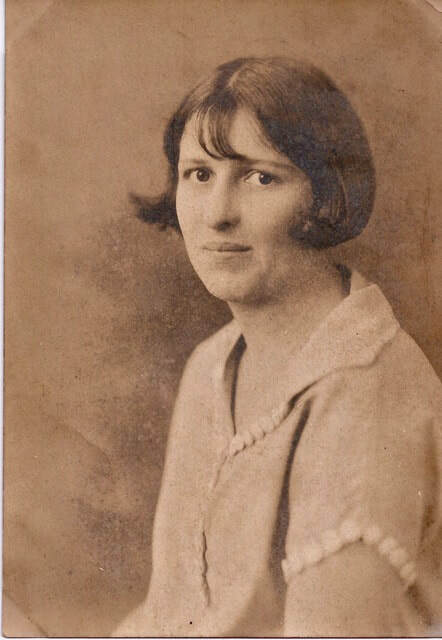 Fortunately, my grandmother who lived with us, was home to comfort me. She explained that the girls who verbally attacked me learned the words they used from their parents and that what they said was not true. My grandmother talked with me about our religious history and how people’s religious beliefs were personal and should not be ridiculed. She helped me understand how adults speak to children and how children speak to one another matter. My grandmother taught me our words matter. Later, when I was 14, I interviewed for a summer internship at Houston’s psychiatric research hospital, the Texas Research Institute for Mental Sciences (TRIMS). During the interview, the hospital director asked me what I thought about people with mental illness. It just so happened I had just finished reading, “I Never Promised You A Rose Garden” by Joanne Greenberg, a book about a young girl’s struggle with mental illness. I told him I thought that people with mental illness were like anyone else except they had problems they needed help with. I got the internship and worked as a ward clerk in the acute psychiatric unit at TRIMS from 3 pm to 11 pm all summer. The job at TRIMS taught me that a person’s mental health is key to their wellbeing. In 1992 when became a mother, I already knew from my childhood how important being active and having a healthy diet are for good health, but I had a lot to learn about raising a child. My son attended preschool at the Phoenix School in Austin where the lead teacher, Kim Longacre, taught me the amazing capacity of children to learn. She taught me that with the right approach, children could be taught complex concepts that included taking care of themselves, each other, their classroom, and their planet. Kim also affirmed that our words matter. Much later in 2009, after stints as a legislative staffer for the Texas Senate Subcommittee on Public Health and owner of a public policy/health consulting firm, I read a study that found that children born after 2000 were likely to have shorter lives than their parents due to childhood obesity and other threats to child health. This led me to seek a way to change this outcome and to build a healthier future for our children, ultimately to founding HealthStart Foundation in 2010. Normally I begin my story about how I came to start HealthStart by citing this study, but what lead me here is more nuanced. It is the accumulation of my experiences that taught me health has three parts: 1. what we eat, 2. how we move our bodies, and 3. our social and emotional wellbeing or mental health. HealthStart tackles all three parts of a child’s health – nutrition, fitness, and social and emotional health. Kim Longacre became HealthStart’s Director of Education and developed our Health Education for Youngsters! (HEY!) Curriculum with the oversight and guidance of HealthStart’s Scientific Committee. Our curriculum teaches children how their bodies work, the food and fitness habits needed for good health, and the importance of taking care of one another and our planet if we are to build healthy communities. We know our diet and fitness habits affect our health. Most people also know that air and water pollution contribute to our health. However, many people do not realize social stressors also impact our wellbeing. For example, recent studies have found race-based stressors (racism and race discrimination) have an impact on people’s psychological and physical health and can lead to depression, high blood pressure, and anxiety. (Carter et al., 2005; Clark, Anderson, & Williams, Clark, 1999; Pascoe & Smart Richman, 2009). Today HealthStart teaches that words matter. One of my favorite lessons can be found in the “Meet Your Brain” unit of our HEY! Curriculum. Titled “Words That Pollute,” this lesson begins by asking teachers to “Remind students that words can be tools or they can be weapons. Tools are for building and fixing, weapons are for hurting and destroying.” The teacher uses puppets to show children how to use words to resolve conflict and find common ground. Part of taking care of each other is how we use our words. As adults this means modeling behavior for our children so that they learn to use words as tools. Too often today we see our leaders using words as weapons – in ways meant to hurt and destroy. We see this when their words are used to call out a particular a religious group or group of people because of the color of their skin. One of the ways to protect our children’s health is to combat the use of words as weapons. This means curricula like HealthStart’s HEY! Curriculum and programs like our Children’s Health Education Workshops (CHEWS) that teach children 3 to 10 years of age about all three parts of health. The collective experience of my childhood, early exposure to people struggling with mental illness, learning the importance of diet to health, my college and graduate education, and becoming a mother led me to champion child health through HealthStart. With our staff, volunteers, and board, HealthStart has developed the blueprints for building healthier communities through children's science-based health education. If you have experienced discrimination, how did it effect you physically or psychologically? A couple of weeks ago I was asked if I wanted a ticket to hear Presidential candidate Andrew Yang speak in Austin. “The last time someone asked if I wanted to hear an unknown Presidential candidate speak in Austin it was Barack Obama – so sure, I’d love a ticket”, I replied. A few days later, one of Andrew Yang’s campaign staff called and asked if I would speak at his event about the importance of early childhood health education. I was honored and readily agreed. Now I’m not sure whether Andrew Yang’s my guy, but he raised a number of interesting points and two of his platform priorities are things I care deeply about: early childhood education and access to healthcare. Both issues can deeply affect our children’s future success. When I worked with the Texas Legislature about 15 years ago, Texas ranked in the top 5 in the nation for uninsured kids. Today, Texas ranks #1 for uninsured kids[i], # 2for kids who are obese[ii], and 43rdfor child wellbeing[iii]. This can lead to illnesses and conditions that prevent learning from taking place and can cause chronic diseases like heart disease, diabetes, and asthma in adulthood. One reason Texas is experiencing high rates of obesity and low levels of child wellbeing is because we do little to help our children establish good health habits early. This is why HealthStart has made it our mission to provide the blueprints for building healthier communities through children’s science-based health education. Our work with childcare centers, health care clinics, and other community organizations helps children set a solid foundation of good health habits early in life. How early do we start? Age 3. That’s because by the time a child is 5 years old, they have begun to develop food, fitness, and social/emotional habits that may well shape their health as adults. One of HealthStart’s first preschool teachers, Frank, is an example of what can happen when you grow up with misconceptions and poor health habits. Frank had been a successful investment banker, but he was unaware of how the unhealthy choices he was making were setting him up for a chronic disease. He really didn’t know any better. He grew up eating a diet of fatty, processed food and drinking Big Red – basically the same food his parents had grown up eating. He was too busy to exercise. No one had taught him about the proper way to fuel himself. In his 40s he suffered a massive stroke that left him unable to continue working as an investment banker. Although Frank loved his job teaching preschoolers, he believed that if he’d been taught lessons like those in HealthStart’s Health Education for Youngsters (HEY!) Curriculum when he was little, he might never have had a stroke that left him unable to continue with his career as an investment banker. In fact, I often I hear from preschool teachers, parents, and clinic workers that they wish our curriculum had been around when they were children. That’s because, like Frank, many people have misconceptions about their health. 1. “It takes too much time to be physically fit”. Kids 6 to 17 years of age should be physically active 60 minutes and vigorously active 3x’s/week, they don’t, however, need to be active for 60 minutes at a time. In fact, it works best when kids are active throughout the day. At Home: Rainy day at home, no problem. HealthStart suggests having your kids run in place as fast as they can during TV commercials. Looking for something to do as family? A great way to combine learning and moving your body is to play “I Spy” as you take a 30-minute family walk around the neighborhood. Study after study shows healthy food per se does not taste bad, but often it is unfamiliar. Families often eat and enjoy what they know or what they grew up with. At Home: Not everyone can afford to experiment with food at home, but HealthStart has found that when new foods are presented in fun ways kids are willing to give something new a try. You can find a recipe book with instructions for easy, quick, fun, healthy snacks at http://bit.ly/hsfrecipebook. Be sure to share pictures on social media with the hashtag #hsfyummy. When we are young it is easy to believe, especially if we don’t struggle with our weight or suffer from other health-related problems, that we never will have to change our eating or exercise habits, but like a car our body needs quality fuel and regular maintenance. So, ensuring we eat food that feds every part of our body and exercise in ways to keep our body strong is essential to health later in life. At Home: The key here is starting early to set a foundation for a healthy diet and regular physical activity. As noted above helping your kids stay fit need not take huge chunks of time and getting them to try new food can be fun for the whole family. 4. Health is predetermined by your genes or other things you can’t do anything about. In fact, social and economic factors and health behaviors including what you eat, how active you are, and other behaviors such as tobacco use contribute to 80% of a person’s health. Education is one social factor that greatly impacts adult health. Children who start their education as preschoolers and stay in school through college have better economic opportunities than those who don’t. At Home: Start by helping your children set a foundation for good health by modeling good health habits yourself. If you smoke, try to quit. If you are sedentary to try find ways to move, preferably, with your kids every day, and if you are vegetable adverse agree to try a new food when your kids do. HealthStart is working to assure every child has the tools needed to make good health decisions with our curriculum, nutrition education, and community health education workshops. Our children cannot reach their full potential unless they are both educated and healthy. 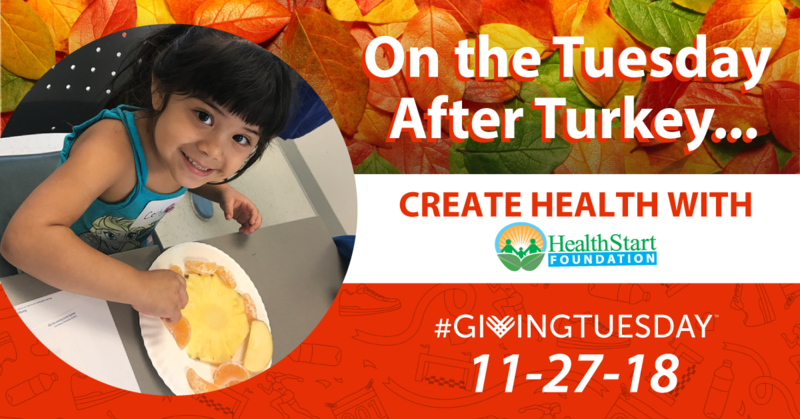 It’s HealthStart’s vision that through our programs children will become “health change agents,” sharing what they learn with their families and influencing the community at large by changing how we eat, move, and live together. What steps do you believe we can take individually and as a community to ensure a future where every child is both well-educated and has the foundation for making good health decisions? I’d love for you to share your thoughts. We are currently looking for volunteers for the summer or if you would like to learn more about our programs, please reach out to erin.damm@healthstartfoundation.org or check out our website @ www.healthstartfoundation.org. 2018 has been a great year for HealthStart. We forged new partnerships with the Housing Authority of the City of Austin (HACA) and our public library system. 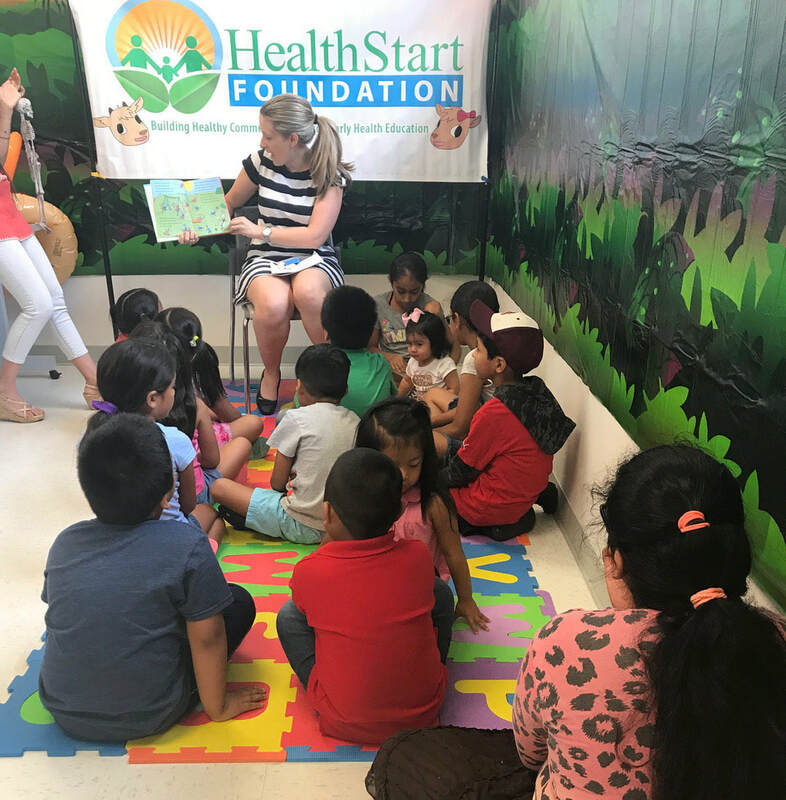 In the summer and fall of 2018 HealthStart delivered more than 30 Children’s Health Education Workshops (CHEWS) for kids living on HACA properties and those visiting our downtown library. Three new preschools and one new elementary school joined the 17 existing pre/elementary schools that have adopted HealthStart’s Health Education for Youngsters! (HEY!) Curriculum. HealthStart officially launched our mobile game app during International Game Day in November at the downtown public library. Kids adopt a baby monster when they play Monstralia™: A Healthy Life For Your Little Monster. While taking care of their monster, they learn how to keep themselves healthy. You can find and download Monstralia™ in the Google Play Store. In total, since 2010 HealthStart has reached more than 4,400 Central Texas kids between the ages of 3 and 10. We’ve provided these children with the tools for making good food choices, keeping their bodies strong, and taking care of one another and their planet which together creates community wellbeing. Thanks to you, our goal is for every Central Texas child to have a solid foundation for good health is coming to fruition. 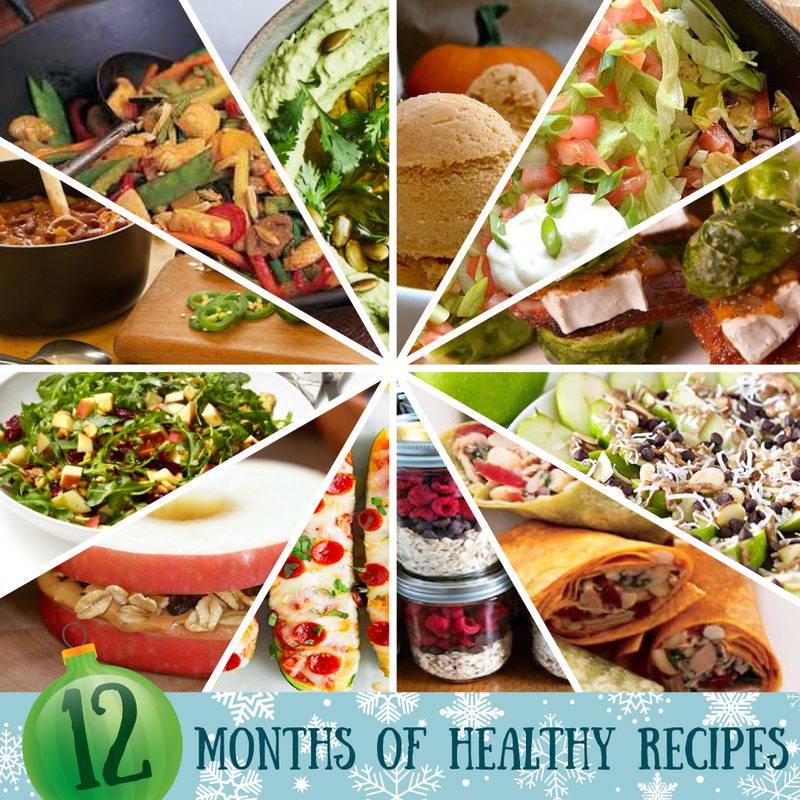 ​On the TWELFTH day of HealthStart you supported, TWELVE months of HEALTHY recipes. HealthStart loves to find healthy, fun, affordable recipes to feed all five body systems and our gift to you this Christmas day is a recipe book with 12 months of them. Download your own copy and share with your family. Be sure to send us pictures (link to a form to submit photos?) of your creations! Thank you for taking the 12 days of HealthStart journey with us this holiday season. Happy holidays and a Joyous New Year to you and yours! Volunteering connects you to others, creating new friendships and increasing social skills. Volunteering is good for your mind and body, combating depression, boredom, and increasing happiness as well as keeping your physically active in the community. Volunteering can advance your career, teaching you valuable skills and increasing career experience. Volunteering brings fun and fulfillment into your life, choose something you are passionate about and the rest will fall into place. HealthStart offers a variety of volunteer opportunities throughout the year. Contact Outreach Coordinator, Erin Damm, for more information.